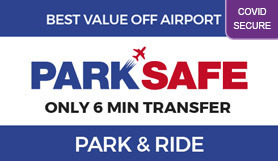 Parksafe is one of Glasgow Airport's most established car parking brands. This service is cheap, efficient and secure. With this car park you get to keep your own keys, for that added level of security and reassurance. When you return, your car will be in exactly the same spot as when you left it. Please print and take the confirmation email with you on your day of travel. Upon arrival to the barrier of the car park, your allocated car parking space will be displayed on screen.Then make your way to the customer waiting room. Then you will be transferred to the Airport. Phone the car park using the freephone in the baggage reclaim area. Make your way outside the terminal to the bus stop 5 directly outside International Arrivals, where you will be collected and then transported back to the car park. - Exit M8 at JUNCTION 28a (A737 Irvine. - Join the dual carriageway (A737) Irvine. EXIT after approximately 1 mile for LINWOOD (A761) and follow the slip road (right hand lane), leading to Linclive roundabout. - The SECOND EXIT from roundabout for Linwood Industrial Estate (BURNBRAE ROAD) and the second left into BURNBRAE DRIVE. - Parksafe is 100 yards on your left. - Exit M8 at JUNCTION 29 (A737 Irvine). - Take the FOURTH exit off the roundabout (A737 Irvine). - Exit A737 for LINWOOD. Take the right hand lane on the slip road. - Linwood Industrial Estate (BURNBRAE ROAD) and the second left into BURNBRAE DRIVE.